Q. What is the current status of Akari's successor mission, SPICA? Akari's main mission is to make survey-type observations, which are expected to bring us a list of newly discovered interesting objects. Once we get this exciting list, we would very much like to study details of individual objects. SPICA, the Space Infrared Telescope for Cosmology and Astrophysics, is designed for this purpose. The performance of a telescope is basically determined by the size of its mirror. The bigger the mirror, the more light can be gathered, which allows detection of darker objects. The bigger mirror also improves spatial resolution. 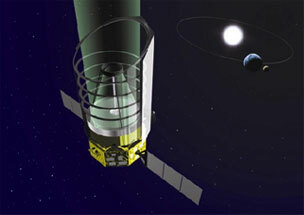 The aperture of Akari's telescope is about 70 cm; SPICA will have a telescope with a 3.5 m aperture. Such a large aperture will radically upgrade the telescope's performance. It might even be possible to observe the birth of the very first star in the universe. We also anticipate that we'll be able to study extrasolar planets (planetary systems in other solar systems) directly. The challenge is how to cool the telescope. With Akari, we're using liquid helium to cool the telescope, and because it is easy to evaporate, we built a high-performance cryostat. Akari's telescope weighs only 11 kg, but the whole cryostat is very heavy, weighing 460 kg -- a 460 kg mass to cool an 11 kg mirror! If we use the same technology, no rocket could launch a larger telescope. So we have changed our design philosophy and proposed an idea of launching SPICA's telescope at ambient temperature and cooling it once it has reached space. For this purpose, we're currently developing a mechanical cooling system under the collaboration with the Institute of Aerospace Technology (IAT) and the University of Tsukuba. We started working on the system a few years ago, and have been successful so far in making a cooling system that can achieve 12 mw cooling power at 1.7K. We're working also on developing a light mirror using silicon carbide. A glass mirror, which is commonly used for telescopes, would be too heavy for SPICA. We have made a 70 cm mirror, and are now testing it to see whether it will hold its shape in an extremely cold environment. Using silicon carbide, we expect to have a mirror that weighs only one tenth as much as Hubble's glass mirror. We are proposing to launch SPICA in the mid-2010s, and the map created by Akari will play a very important role in the detailed observations by SPICA. Q. Why are you interested in astronomy? Astronomy has unique features among the natural sciences. One is that it is almost impossible to make astronomical experiments. We cannot create a space environment in a laboratory. First, it would take nearly forever. Just to create a star would take hundreds of thousands of years. It would also require a room large enough to fit something the size of the Sun, which is obviously not realistic. So we use the universe itself as our laboratory. Einstein's General Theory of Relativity makes sense theoretically, but has very little to do with our daily lives. However, in space science, you have to take it into account all the time. Space is an invaluable place for verifying theories that would otherwise exist only in our heads. Another unique point of astronomy is that we can study the history of the universe directly. Observing objects at great distances corresponds to learn about the objects in the past. The light emitted from an object 1 billion light years away, for example, was released 1 billion years ago, which means that we are looking directly at of the universe? past . So, in a sense, Akari is like a time machine that flies around in the vast laboratory of space, attempting to uncover the history of the universe by observing objects at great distances. I'm looking forward to witnessing the process of the dynamic evolution of the universe. 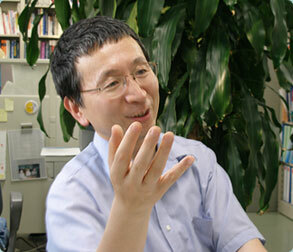 Prof. Nakagawa graduated from the Department of Astronomy, Graduate School of Science, the University of Tokyo in 1988. He has been with ISAS since 1990, and a professor since 1999.